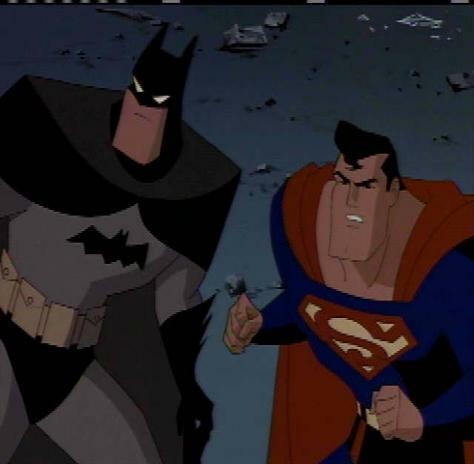 Cartoon Network had a Superman/Batman marathon on a Saturday not long ago. I had good intentions of taking at least part of it in, but it wasn't to be. I have caught a few of the Superman episodes in the afternoons recently and have been pretty pleased with what I've seen. There have been appearances by Bizarro, Mr. Mxyzptlk and other classic villains who populated the Silver Age. I also noted that on the Netscape page, they had a poll going. "Superman vs. Batman." Why do they do that? I used to frequent a Batman website and the discussion board there quite often had the same theme. "Batman vs. (fill in the blank). Who would win?" That blank space was populated with everything from the interesting to the absurd and the poster would often passionately defend their choice of foes. 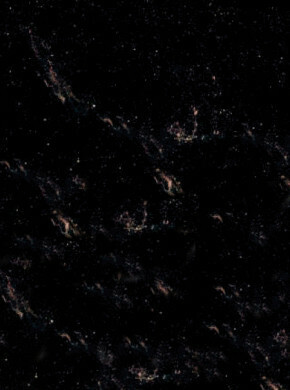 "Well, I think Batman would have a good chance at taking on Galactus as long as he had sufficient time to prepare." I bring this up as a way to illustrate what I think is the absurdity of comparing DC's best known and longest serving heroes. Much like the wry observation of one poster at the Batman board, "Batman vs. The Hulk? Simple. Squish!" I feel similarly about what I feel is the silly notion of pitting these two against one another, even though recent storylines have had them, at least philosophically, at odds and in one particular instance, physically at odds. While I've had Frank Miller's "The Dark Knight Returns!" praised to the rooftops to me by many as a classic effort, I have yet to read it and am not certain I will. The idea of a battle between two of my favorite heroes just doesn't appeal much and frankly, I think Miller's art stinks. Whatever happened to the days when Batman and Superman were friends and comrades in arms, even going so far as to admire one another's work? After all, didn't they both spend time together at Justice League headquarters and in World's Finest comics? Darn straight they did and I for one don't care for this tension and distrust that has crept into their relationship the last many years. I like a darker Dark Knight, but he doesn't have to be so exclusionary as to keep everyone around him at a distrustful distance, including one of his longest standing partners. You didn't, however, tap into here to read railings about how the modern storylines have gone down the tubes in my superior opinion, so let's get to it. I offer for your consideration a classic imaginary story from the Silver Age featuring the World's Finest team in the magazine of the same name from December of 1967, on sale 10/26/67, issue #172 (+ back cover) wherein, under the direction of Editor Mort Weisinger, writer Jim Shooter challenged our imaginations with the premise of "Superman and Batman...Brothers!" Art, cover and interior, is supplied by the incomparable Curt Swan and George Klein, who not only did the definitive Silver Age work on the Man of Steel, but also did a pretty bang up job on the World's Greatest Detective. Wouldn't you know our splash page puts us right into the type of conflict I just finished criticizing. A pajama-clad Clark Kent is decking Batboy, who is losing his grip on a bag of jewels. A row of Superboy robots stand silent vigil over the scene from the background as Clark states, "So-you found my secret closet with my robots, eh, brother Bruce? It's bad enough you're a thief, but now that you've ferreted out my Superboy identity, I'll show you no mercy!" The first few panels recount the origin of our two heroes, from the trajectory of baby Kal-El's rocket from the doomed world of Krypton to the fateful evening when the Wayne family attended a movie and young Bruce became an orphan at the hands of a merciless mugger turned murderer. The idea, of course, is to illustrate that both these boys share being orphaned and in this story, they will soon share the same adoptive parents in the form of Jonathan and Martha Kent of Smallville. The next segment of the story takes place a few days later as Superboy is performing for a charity exhibition by going into the ring with a giant robot of his own design. Demonstrating his super speed and super strength, he soon overcomes and shatters the automaton, providing a pile of ready made souvenirs to be auctioned off to the spectators for charity. Concurrently, a visitor has called on the Kent home. Mrs. Swan from the orphanage has come to commend the Kents on being such fine step-parents and to ask if they'd consider taking another boy. Martha hesitates, but when she learns of the tragic events that led to Bruce Wayne's being left alone in the world, she changes her mind and opens the Kent home again to another son. Initially, Clark is taken aback at this turn of events, wondering how he can continue to function in his dual identity with this new member of the household in attendance, but Ma Kent insists it will be good for him to have some companionship. As they days roll forward, Clark observes, perhaps tinged with a little jealousy, that his new sibling isn't forced to restrain himself academically or when he confronts and defeats the school bully in full view of the students. Clark observes, however, that Bruce seems to be completely self-absorbed and that he whipped the bully with a sort of vengeance. He also notes that Bruce is driven in other ways, spending all his spare time delving into complicated text material. He concludes that he and his brother are too different to ever collaborate on anything. Soon the two youths observe trouble in Smallville as the dreaded tank gang drive their tracked vehicles toward the local bank and begin blasting with their cannons. As Bruce wanders into the crowd, Clark seizes upon the opportunity to slip away and change into costume to subdue the crooks. As he makes short work of the tanks, he notices Bruce snapping photographs of the would-be bank robbers. Indulging in a little detective work of his own, Clark discovers the photos Bruce has taken, along with detailed notes of their techniques and to further intensify the mysterious behavior, he notes a collection of books in a drawer profiling famous crimes and criminals. The uneasy Clark begins to wonder what is motivating this fascination with the underworld in young Bruce and his suspicions are further piqued when he observes his brother fashioning a costume that is similar to the cowled garb of the tank bandits and appears to be preparing weapons as part of the uniform. Days later, while Bruce's bedroom is being painted, the boys share Clark's room and the Boy of Steel is keeping close tabs on his sibling. After Clark has gone to sleep, Bruce dons the familiar gray and midnight blue costume and rappels down the side of the house and into the night. Hours later, as he returns, "Batboy" makes a small amount of noise while re-entering the room. It's just enough to alert Superboy's sensitive hearing and Clark sees that his brother has returned with a bag of jewels. He decides they must be stolen and that he'll return them in secret and try to reason with his wayward brother about his life of crime. The plans made by Clark are not to bear fruit, however, as the next moment, Bruce loses his footing and accidentally triggers the secret panel leading to Superboy's laboratory and storage area for his robot likenesses. Springing into action, Superboy lands a couple of punches on Bruce's chin, telling him he will stop his life of crime one way or ano ther. Reeling, the boy in the bat costume begs for a chance to be heard. "You have sixty seconds! Better make your story good!" In the next moment, Bruce replies, "Sixty seconds will be enough!" 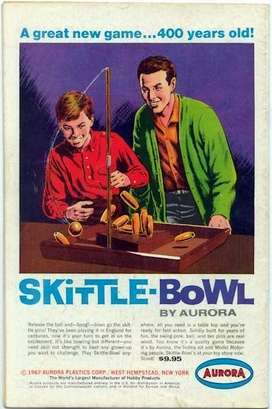 He then produces a pellet of green kryptonite from his utility belt, bringing the Boy of Steel to his knees. He soon puts the deadly mineral back in it's place and explains that he was just trying to demonstrate that he's not a killer, just as he's not a thief. Bruce has chosen the persona of the bat to strike fear in the hearts of the underworld as he seeks them in the night. He then recounts his earlier mission in which he single-handedly took out the "Nails" Koker gang and then brought their booty home until he could return the jewels the next day. Satisfied with Batboy's explanation, the brothers form a partnership on the spot and Part I draws to it's conclusion. Part II, entitled "Tragedy Strikes Twice!" opens years later with Bruce being shown stately Wayne Manor in Gotham City, his inheritance as a result of his 21st birthday. Then as an additional surprise when the front door opens who should he see but his family waiting for him. Clark reveals that he can easily begin his newspaper career at the Gotham Gazette and the Kent's had planned to sell out and retire anyway, so the entire clan relocates to Gotham in this imaginary story. It isn't long before the services of our heroes are needed and their first encounter is with none other than Lex Luthor, who operates in Gotham and unlike the usual storyline, Lex was unknown prior to this first meeting with Superman. The heroes make short work of Luthor and he's soon cuffed and stuffed, but not before beginning to formulate a plan to destroy the team of Superman and Batman. A few days later, Luthor does indeed break jail and the brothers are monitoring the police bands for a lead to bring him in again. Unfortunately, a power failure in nearby Oak City requires the attention of the Man of Steel, while Batman goes on patrol. Receiving a transmission on the Batmobile's radio, the Dark Knight realizes to his horror that Luthor has struck at the very charity bazaar that Martha and Jonathan Kent are attending. Bruce's worst fears are realized when he arrives to discover Luthor in a large spaceship with none other than the Kent's being held hostage. Batman enters the ship to rescue his parents, running a gauntlet of weapons and booby traps and shocking Luthor with his dogged determination to save the "nobodies" he has captured. As the Masked Manhunter reaches the chamber where the Kents are incarcerated, he begins to crack the door with acid from his utility belt. In desperation, Luthor detonates a charge, blowing the chamber to bits. Incredibly, Batman survives the blast and begins to pummel Lex until the authorities take custody of him. In tears, the Batman leaves the scene of devastation. Later the brothers are reunited and Bruce reveals to Clark his intent to dispose of his property and leave Gotham City. Superman tries to convince him to stay, but the Batman states simply that there are too many memories there and that while they share a common loss, he has now lost two sets of parents to murdering criminals and he will travel until he finds a place where he can find peace. Superman's thoughts race and inspiration strikes. He wraps Bruce up in his protective cape and flies through the time barrier to the 30th century and Legion headquarters. After a brief conference with Cosmic Man, it is agreed. The Batman will be the newest member of the adult Legion of Super-Heroes while Superman continues to keep Gotham City safe for law-abiding citizens in the 20th century. As an added bonus, this issue features the Editor's Roundtable reprint of "Tank For Beach Green!" 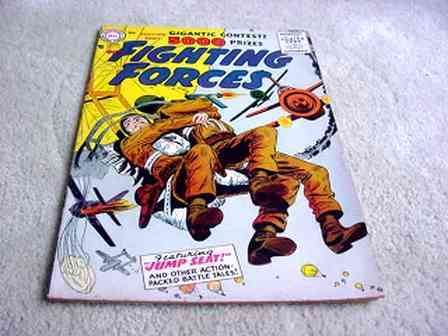 that first appeared in Our Fighting Forces #12 dated August, 1956. This Bob Haney penned war time tale benefits greatly from the gritty, rough and tumble artistic style of Joe Kubert. It's hard for me to quantify the reason, but I've always got a particular kick from the imaginary tales of the Silver Age. Maybe it's the idea that the envelope can be pushed in new directions, creating a refreshing change in familiar storylines. Obviously I'm not alone in my appreciation as the genre has been around for a long time and continues today in the "Elseworld" series of stories. Whatever the appeal, I have yet to find one that I haven't enjoyed and this issue is no exception. 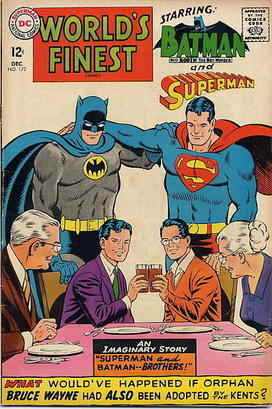 I think it also aptly demonstrates the reason that Batman and Superman have long been known as the World's Finest team. I believe they complement one another very well. You have the tremendous powers of the Man of Steel and the razor sharp mind and keen deductive skills of the World's Greatest Detective, working in tandem toward a common goal. With those credentials, how could you possibly go wrong? So for those who continue to insist on debating the superiority of one character over another I say, give it a break. Each is superior in his own sphere and together, they're simply beyond compare. The Sage rating this time around is a solid 9 for a great, imaginative tale worthy of classic status. Thanks to you, faithful readers new and old for joining me here. If you have a comment or an opinion, I'd be delighted to hear from you. Write to me at professor_the@hotmail.com and tell me what's on your mind. I'd appreciate your feedback. Don't forget to make your way back in approximately two weeks for another summary from this outstanding era.